Slipstick sliders come in the size 3/4" which is ideal for the use of .75" to 1" diameter legs. Specially formulated so you can slide chairs in and out easily without causing damage. Available in the color black and comes in a pack of 16 slider feet's. 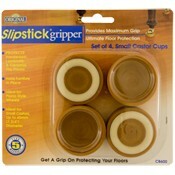 Slipstick Grippers are used for unwanted furniture movements and scratches to your floors. They easy to install to your furniture's and comes in 3 different sizes and two colors. Sizes available are 1.25", 2", and 3.25" with the colors chocolate and caramel. New from Installerstore! 4.5" x 6" heavy duty Slipstick felt pads. Protect your floors from scratches! Prevent your furniture legs from costing you a fortune in repairs with easy to install self-adhesive pads. Slipstick leg coasters are great for legs up tp 1.75" diameter protecting hard surfaces from scratches. They are available in the color of chocolate and caramel. Slipstick leg coasters come in a set of 4 per package. Slipstick risers are 2" height x 2" diameter. These risers are ideal for hardwood/ceramic floors and will prevent scratches. Protect your hard surface floors from damage by your office chair wheels. Slipstick Rubber Castor Wheels will replace your standard wheels in a snap then no more chairmats needed. Slipstick Swivel Feet are ideal for protecting floors from chairs with slanted legs. They are compatible with chair legs 3/4" - 1 1/4" in diameter. Protect your flooring investment with these Slipstick universal attachment castor wheels! These rubber furniture wheels are ideal for chairs, tables, racks and more! Sold in packs of 4. These Slipstick feet are perfect for straight leg chairs that you want to slide but not have them damage your floors. Stop furniture wheels from moving and protect your floor with these Slipstick castor cups for hard surface floors. Keep your furniture from slipping and sliding on your carpets. Carpet castor cups also disperses the weight load of your furniture to help reduce denting of your carpet pile. New from Installerstore! Heavy duty Slipstick felt pads. Protect your floors with easy to install self-adhesive pads. Sizes: .75", 1", 1.5". New from Installerstore! 1/2" x 2 5/8" heavy duty Slipstick felt pads. Protect your floors from scratches! Prevent your furniture legs from costing you a fortune in repairs. New from Installerstore! 37 piece assortment pack of heavy duty Slipstick felt pads. Protect your floors from scratches! Easy to install self-adhesive pads.